If you're on the lookout for a casual yet seriously stylish outfit, team a dark green gilet with Frame lhomme slim fit jeans. Both pieces are totally comfortable and will look great together. If you're looking for a casual yet dapper look, choose a navy shawl cardigan and Frame lhomme slim fit jeans. Both pieces are totally comfortable and will look great together. When it comes to footwear, this getup is complemented wonderfully with dark brown suede desert boots. Contrary to what you might believe, looking sharp doesn't take that much a work setting. 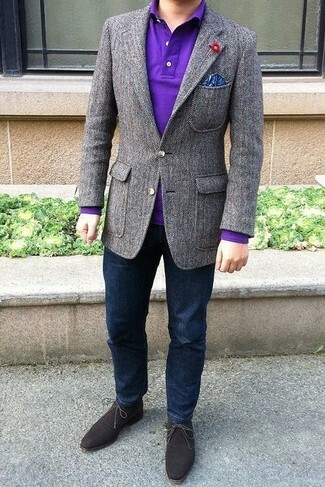 Just marry a grey wool blazer with Frame lhomme slim fit jeans and you'll look amazing. When it comes to shoes, this outfit is complemented nicely with dark brown suede desert boots. If you're searching for a casual yet stylish look, opt for a grey v-neck sweater and navy jeans. Both items are totally comfortable and will look great paired together. When it comes to footwear, this ensemble is finished off wonderfully with tan suede desert boots. 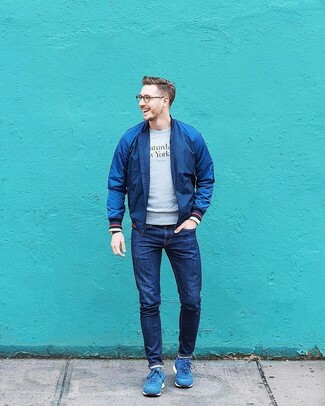 This pairing of a navy bomber jacket and Frame navy jeans is extremely versatile and up for whatever's on your to-do list today. For a more casual aesthetic, why not introduce a pair of blue athletic shoes to this look? 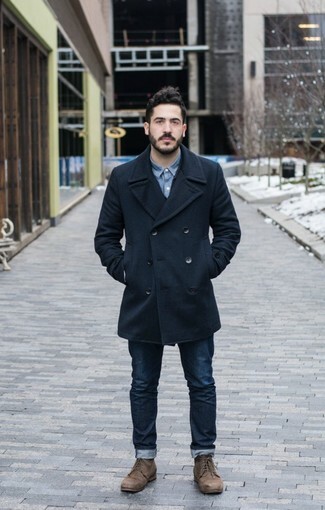 Marry a navy pea coat with Frame Lhomme Slim Fit Jeans from Nordstrom if you're aiming for a proper, seriously stylish look. 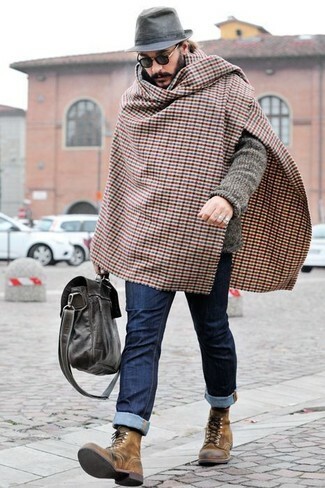 Complete this outfit with brown leather casual boots and the whole look will come together. 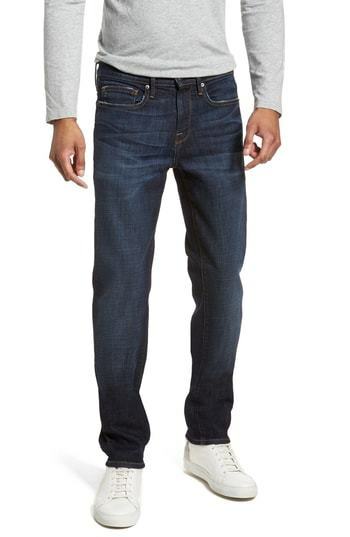 If you're on the lookout for a casual yet sharp getup, rock a grey knit cardigan with Frame lhomme slim fit jeans. Both items are totally comfortable and will look great together. Perk up your getup with brown leather casual boots. 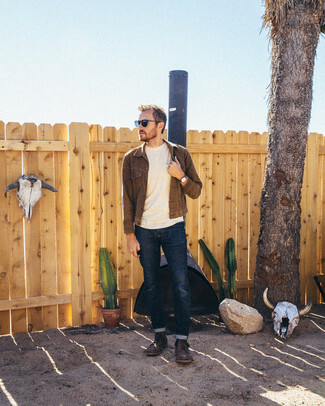 If you're on the lookout for a casual yet seriously stylish look, pair a dark brown denim jacket with Frame lhomme slim fit jeans from Nordstrom. Both garments are totally comfortable and will look great together. Kick up the cool of your ensemble by wearing dark brown leather casual boots. An olive plaid blazer and Frame lhomme slim fit jeans is a good combination to add to your styling repertoire. Turn your sartorial beast mode on and opt for a pair of tobacco leather oxford shoes.